Noticed any increase in food prices yet? Here in Texas, all meat prices are up, but especially beef. Beef ranchers in Texas sold off their herds because they couldn’t feed them during the drought, except with very expensive imported hay. That held prices down for a while, but now there is a lot less beef to be bought. Prices rise. Drought also hammered corn crops this year, and last year. To keep corn markets growing, corn state legislators had gone whole hog into using corn for alcohol to be added to gasoline. That demand didn’t drop with the crop decreases, however, and we’ve been hearing for months how corn-into-alcohol pressures food markets. Drought hammers our fruit crops, too. Comes now news from Washington state about the added wrinkle: Washington’s apple crops bend the tree boughs — who will pick them? Two key problems: First, the crackdowns on immigrant workers reduced supply dramatically. Second, citizens or documented workers find higher pay in the turnaround in construction. Result: Apples may stay in the trees, boosting apple prices to consumers. Wholly apart from the foolish denial that we need to do something about global warming, the added policy flaws of shutting off immigration flow on the chuckle-headed and wrong assumption that immigration hurts the economy, and the continued denial of our too-modest economic recovery, will now cost you money directly at the supermarket. PASCO, Wash.—Washington state is enjoying the second-biggest apple crop in its history, but farmers warn they may have to leave up to one-quarter of their bounty to rot, because there aren’t enough pickers. “I’m down 40% from the labor I need,” said Steve Nunley, manager of a 3,000-acre apple orchard for Pride Packing Co. in Wapato, Wash. Mr. Nunley said he has 200 pickers right now, but needs close to 400. He has increased pay to $24 for every 1,000-pound bin of Gala apples they pick, compared with $18 last year. Even so, he expects to have to let tons of fruit fall unpicked this season. 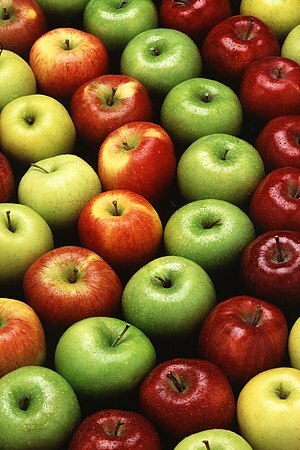 Washington’s bumper crop, forecast at 109 million boxes of Red Delicious, Gala, Granny Smith and other varieties, comes as drought and poor growing conditions have led to dismal harvests in parts of the U.S. Michigan lost much of its apple crop this year, and poor conditions have depressed the yields in New York state and North Carolina. But Washington’s farmers can’t fully cash in on their good fortune. The national crackdown on illegal immigration has shrunk the pool of potential farm workers in the state, while at the same time, the modest economic rebound has given immigrants more opportunities than before in construction, landscaping and restaurants. Not far away, outside a church in Pasco, a migrant from Mexico’s Michoacán state, 47-year-old José Carranza, said he planned to skip the fruit harvest this year. Mr. Carranza believes he can do better in construction work, which is picking up. The Daily News (Batavia, New York), September 22, 2012: “Fewer farm workers locally due to light apple crop”–The record hot spring followed by bitter cold temperatures in late April killed many of the buds that later produce apples. The apple crop in Michigan, Ohio and Minnesota was largely destroyed by the spring weather. However, Washington State, the nation’s top apple-producer, has a bumper crop this year.Jerome Pawlak, owner of Save-A-Lot grocery stores in Albion and Holley, said some farmers have already called him to say they won’t be bringing in crews this year to cash checks, go shopping and use the Western Union service to wire money home. How much additional will you be paying for goods this year because of GOP “we-can’t-afford-to-be-great-anymore” policies, or racist immigration policies? Will your modest tax cuts offset that expense? Perhaps we should pay a bit more in federal money to help fix the real problems, and stop pretending that the price of everything is the same as the cost. You know the aphorisms: A conservative economist is a person who can tell you price of any item or service, but doesn’t know the value of education, parenting, or good social structure, and ignores the costs of doing nothing. And the Tom Magliozzi Law (of the Car Guys): The cheapskate always pays more. Studies from the Federal Reserve indicates immigrants boost our economy greatly; making life tough for immigrants, or hoping they’ll “self-deport,” damages our economy. This entry was posted on Sunday, October 14th, 2012 at 9:07 pm and is filed under Agriculture, Climate change, climate_change, Economics, Farming, Global warming, History, Immigration, Politics. You can follow any responses to this entry through the RSS 2.0 feed. You can leave a response, or trackback from your own site. Ed, the Gina Rinehart who thinks people should be willing to work for $2 a day? She’d get along with today’s Teapublicans. hm, apparently Gina Rinehart owns apple orchards in the US. Would any conservative here like to explain why a business should be allowed to pay such pissante poor wages? I thought that, too — it’s a tribute to the skills of these guys that they can make any money at all. You make the point Cesar Chavez kept trying to make, about grapes, and all other produce in the west. This isn’t going to be popular but if the pay for picking 1,000 lbs of apples is only $24 then it’s no goddamn wonder that they can’t find pickers. I’m not going to shift 1,000 lbs of anything for $24 and that goes triple for having to do that in a field far from home. What is that per pound? A whole 2.4 cents? For apples that retail at $1.50/lb? They could double the pickers pay and it would be a whole 5 cents a pound picking costs. If you’re not seeing apples in the stores because we can’t pay pickers five cents a pound don’t blame the pickers. That’s only 3% of retail costs something most shopping carts loaded with chips and soda wouldn’t even notice.